A LEE Wallace goal half an hour from time pushed Rangers one step closer to the Premiership as they drew 1-1 with Queen of the South to set up a semi-final tie with Hibernian. The result meant Gers, who created a bucket full of chances, won the play-off quarter-final 3-2 on aggregate in front of a sold-out Ibrox. Fans were made to roar and bite their nails in equal measures as Stuart McCall’s side put them through agony on a nervy afternoon that saw Derek Lyle open the scoring for Queens in the first-half. 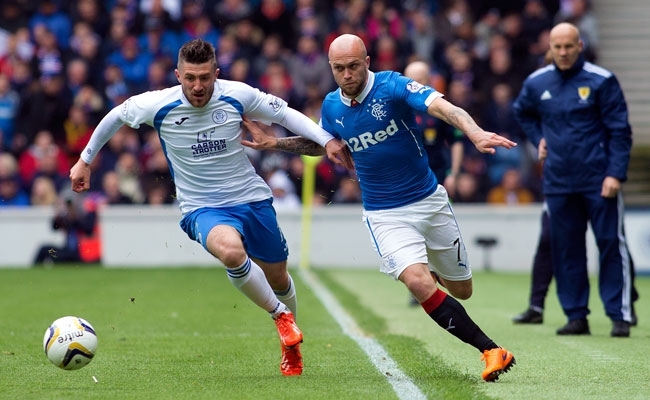 Rangers started the game in formidable fashion as they pressed high up the Ibrox park from the get go. An unmarked Nicky Clark had a golden opportunity to open the scoring within eight minutes but he poked his shot wide from eight yards out. He had latched onto a fizzing ball into the six-yard box from Wallace. Nicky Law found the left-back before he stormed to the by-line and combined in a superb one two with Haris Vuckic to set up the diminutive striker. With the Light Blues hustling for an opener the visitors looked on the back foot and six minutes later it was Law’s turn to go close when Vuckic played a short ball into the feet of the top scorer. He was just yards out but Alexander Clark stretched to paw away the midfielder’s right footed shot and Queens rallied to clear their lines. On 23 minutes another chance went begging when Vuckic pounced on Andrew Dowie’s mistake to take Queens by surprise. With just Clark joining him on the attack he had to find the onrushing forward to profit but he placed his ball just behind him and Clark couldn’t untangle his feet in time to shoot. Five minutes later the Slovenian was involved again when he weaved his way through the defence to pick his shot. Vuckic made light work of the Queens backline as he left them in his wake to mount a typical left-footed effort that Clark had to scramble to swat clear. 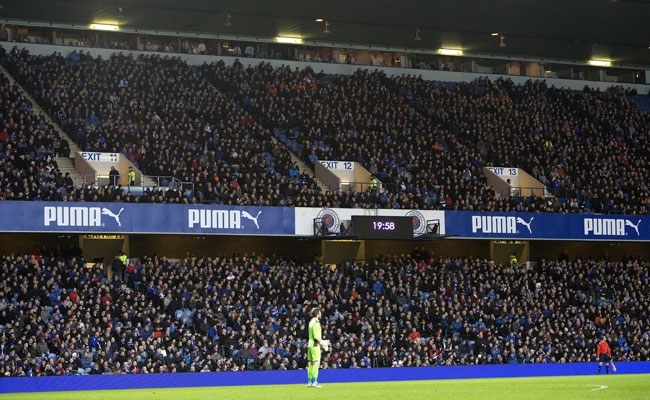 The away side had barely had a sniff at goal but ten minutes before the break they stunned Ibrox into silence as they went ahead and levelled the aggregate score. It was all about Daniel Carmichael’s delivery as he swung a pinpoint cross into the Rangers area. Lyle rose to meet it and bulleted the header beyond Cammy Bell who was rooted to the spot. Vuckic nearly put Gers ahead in the tie again moments later when he riffled a daisy cutter of a free-kick at goal but Clark was there to deny him yet again and mean it was all square at half-time. Rangers started the second period with the same zest they had shown in the first, just to no avail. Clark nodded down to Wallace three minutes after the break but the full-back didn’t make the most of his drilled chance. It had been the visitors turn to rattle Stuart McCall’s men in a five minute spell as nerves became frayed but then Rangers went as close as they had managed so far. Richard Foster looped a cross into the box and Kenny Miller met it with a close range header that somehow 22-yeaer-old Clark stood tall to keep out. The 60th minute was ticking onto the clock when Wallace sent Ibrox bouncing to peg one back for Rangers and send them 3-2 ahead in the tie. Vuckic swung a short ball in from the left of the area which fell at Clark’s feet. He threaded it through a tangle of players and Wallace sprung the offside trap to prod home from a few yards out before wheeling away in relief. Clark, who is on loan from St Johnstone, was denying Rangers time and time again and his impressive form continued when he saved from Law with 18 minutes left to play. Vuckic’s pace helped him down the channel to combine with the midfielder and he cut a shot on the angle at the keeper. He made himself big at the near post and this time it was his feet that kept the net from bulging. With just nine minutes to go Vuckic was to save the tie as he turned defender to clear off the line from Lyle’s lofty shot. His act couldn’t have been appreciated more by his teammates as Bell scooped him up to show his thanks with a hug. And then the 22-year-old stormed down to the Copeland end to link up with Miller but the striker took too long to sort his left from his right and couldn’t get a shot away as he let the chance peter out.